I don't wear that much yellow nail polish but I do have 3 shimmers to compare Mimosa to. I'll start with the least similar and end with the most approaching. Kiko is an Italian cosmetic company, I already introduced it here. This nail polish is quite new, it's from the Spring 2011 H&M nail polish collection, it's a pale yellow with green and orange shimmer. Apart from being lighter than Mimosa, it's also cooler, most certainly because of the green shimmer. Formula wasn't too bad but it wasn't dreamy either, you have to apply 3 thin, careful coats for this result. Catrice is a European brand, I was lucky enough to get this nail polish, along with a few others, from a friend a while back because I didn't have access to it but was lemming it badly. Don't feed the birds is a bright shimmer yellow, again, quite on the sheer side. The shimmer is much more dense than on Mimosa and the shade itself it a tad cooler but it's definitely a good substitute for it, given the price, around $4 for 10ml / 0,34 oz. On the downside, I needed 4 coats here with VNL, but they applied smoothly, I also tried layering it. I used one coat of H&M Going Bananas and one of Don't Feed the Birds and the coverage was perfect this time. In conclusion, I'd say that if you're not ready to drop the $$ on this summer's new Chanel nail polish you'll definitely be able to find something to satisfy the urge for yellow. 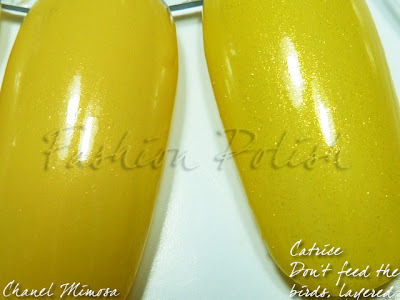 Next shopping tour the Catrice Lacquer will be mine! It's a good alternative to test whether I can handle a yellow lacquer - I never had one before. It's a pitty that Catrice Don't feed the birds is being discontinued now, it's quit similar to Mimosa. Thanks for the comparison! I like a lot of these colours, so now I'll have to hunt for one to wear! phew, good thing i got one of the last bottles of DFTB. Thanks for this comparison, been looking for this everywhere! I also wrote a few words about Mimosa some time ago, so I loved to read the comparison you've made. That Kiko one looks amazing :O !